Angeles waft thee away. Farewell, beloved one, thou art gone, thou wavest thine hand. Ah, now it is light. The pearly gates are open; the golden streets shine in the jasper light. 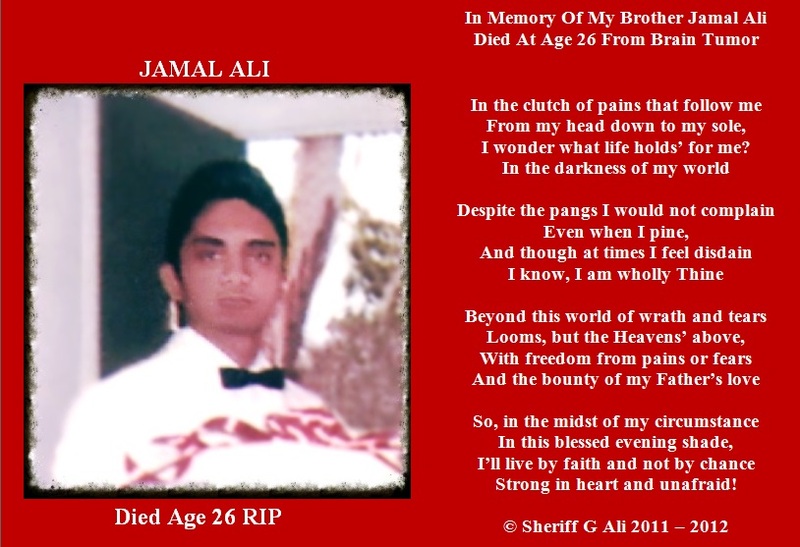 We cover our eyes, but thou beholdest the unseen, adieu, beloved, thou hast light at even-tide, such as we have not yet! AMEN! “In this world of ours, that which matters most is not what happens to the outside of things, but what happens to the inside. When God wants to make a person into what He desires, He puts them into some storm. No pain, no palm; no thorns, no throne, no gall, no glory; no cross, no crown, can be achieved unless and until you walk through the storms of life with and by the Grace of God. 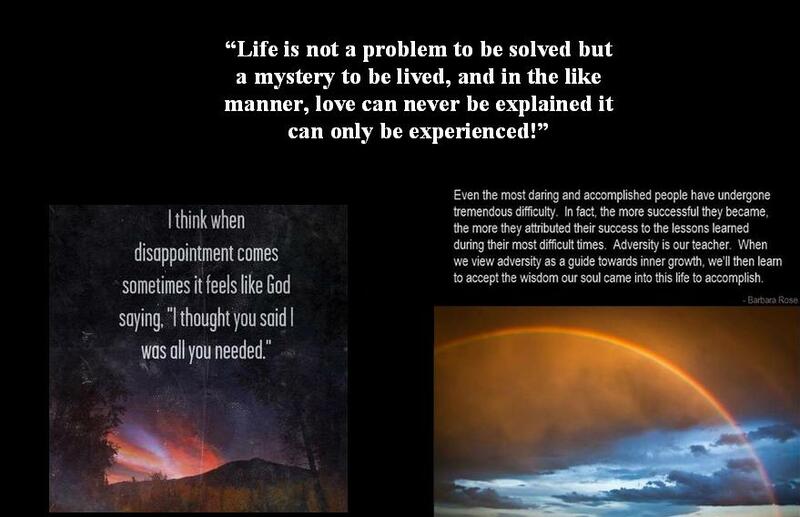 God does not offer us a way out of the storms of life, He offers a way through, and that make all the difference. There is no circumstance, no trouble, no testing, that can ever touch me until, first of all, it has gone past God and past Christ, right through to me. If it has come that far, it has come with a purpose, which I may not understand at the moment. 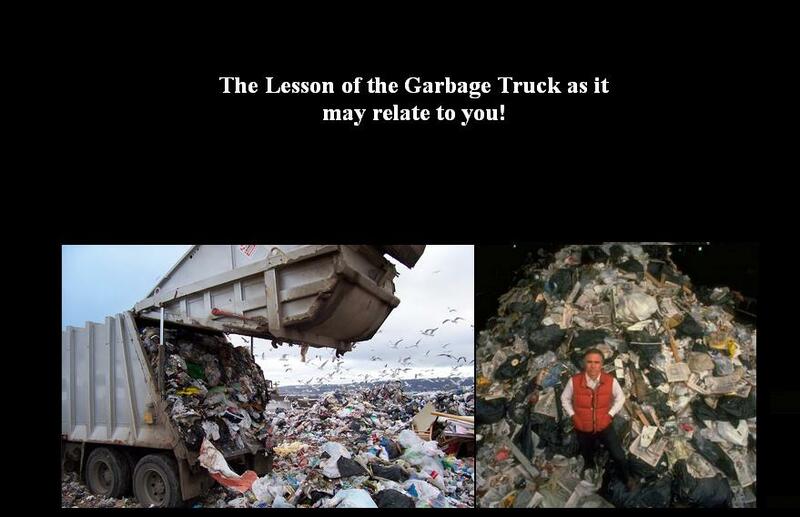 The Lesson of the Garbage Truck as it may relate to you! How often do you let other people’s nonsense change your mood? Do you let a bad driver, rude waiter, curt boss, or an insensitive employee ruin your day? Unless you are the Terminator, for an instant you are probably set back on your heels. However, the mark of a successful person is how quickly they can get back their focus on what’s important. Sixteen years ago I learned this lesson. I learned it in the back of a New York City Taxi Cab. Here’s what happened! I hopped in a Taxi and we took off for Grand Central Station. We were driving in the right lane when all of a sudden, a black car jumped out of a parking space right in front of us. My Taxi driver slammed on his breaks, skidded and missed the other car’s back end by just inches. The Driver of the other car, the guy who almost caused a big accident, whipped his head around and he started cursing at us. Many people are like garbage trucks. They run around full of garbage, full of frustration, full of anger, and full of disappointment. As their garbage piles up, they need a place to dumb it. And if you let them, they’ll dump it on you. When someone wants to dump on you, don’t take it personally. You just smile, wave, wish them well and move on. You’ll be happy you did. I see the load they are carrying. I see them coming to drop it off. And like my Taxi Driver, I don’t make it a personal thing; I just smile, wave, wish them well and I move on. The bottom line is that successful people do not let Garbage Trucks take over their day. What about you? What would happen in your life starting today if you let more Garbage Trucks pass you by? Here is my bet. You’ll be happier! Life’s too short to wake up in the morning with regrets, so, love the people who treat you right; forget about ones who don’t. If you get a chance take it! If it changes your life, LET IT! Nobody said it would be easy, they just said it would be worth it!